Halloween is a fun time for everyone, not just kids. It offers a chance to go crazy with baked items. But I got so preoccupied researching creative designs that I decided to make life easy and adapt my recipe for Chocolate Coffee Cupcakes. This post is about the designs. 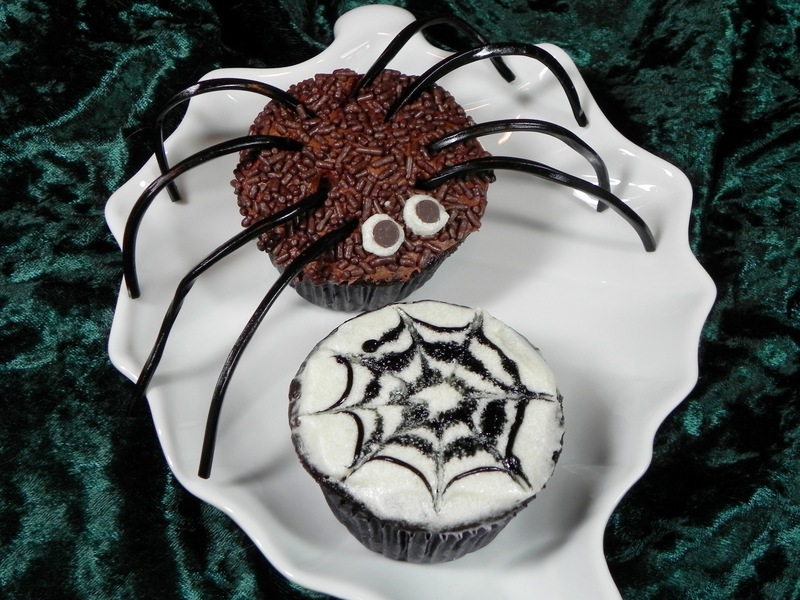 The star of the show is the spider, but I had to make an entire batch of white frosting so I could make eyes. What was I to do with the rest of the frosting? Make a matching spiderweb. This was achieved by placing a flat layer of white frosting on the cupcake and then drawing three concentric circles with melted chocolate. A toothpick was then drawn through the circles to create the web. Cool, right? For Cupcakes: Preheat oven to 350F and line a 12-cupcake pan with paper liners. Whisk together the milk and vinegar in a large bowl, and set aside for a few minutes to curdle. Add the sugar, oil, and vanilla extract to the milk mixture and beat until foamy. For Frosting: Beat the shortening and margarine together until well combined and fluffy. Add the cocoa powder and beat for 1 minute. Add the powdered sugar, alternating with milk, and beat until fluffy. Add the vanilla and beat until incorporated. For Decorations: Place a flat layer of chocolate frosting on a cupcake. Put the chocolate sprinkles on a plate and dip the cupcake in sprinkles until fully covered. Add two small circles of white frosting. Place a small chocolate chip with the point side down in the center of each circle. Cut a licorice whip into eight pieces and insert each piece at spaced intervals. Most baking recipes call for a leavener to give an item airiness and a tender crumb. There are two types: baking soda and baking powder. Why are there two? If I am out of one, can it be replaced with the other? Read further to solve these riddles. “Baking soda is pure sodium bicarbonate—an alkaline powder (aka, a base). 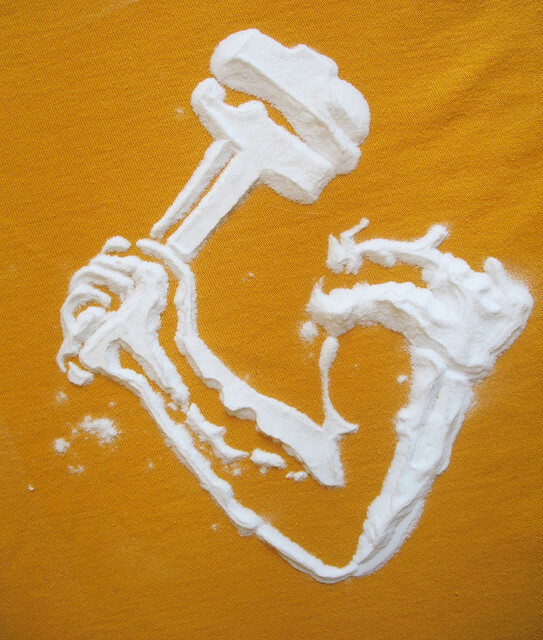 When dissolved in liquid and combined with an acid, it rapidly reacts, breaking down into sodium, water, and carbon dioxide (which) expands upon baking … For baking soda to work, a recipe needs to include a significant acidic ingredient.” So, if you are doing ingredient substitutions in a recipe that lists baking soda as the sole leavener, be sure to keep an acidic item in the ingredient list. There are other actions that baking soda performs and need to be considered. It is also used to “neutralize or dampen acidic ingredients. For this reason it is sometimes used in recipes with a high proportion of ingredients such as lemon juice, buttermilk or other sour flavours. When replacing sugar with a large amount of an acidic sweetener, such as honey, molasses or barley malt syrup, 1/2 teaspoon of baking soda should be added the recipe to account for the increased acidity, even if baking powder is the principle leavener.” Thus, if you are using only baking powder in a recipe with highly acidic ingredients, then the flavor profile may be off due to the extra acid contained in baking powder. Those recipes need a little help from baking soda. Another interesting baking soda fact is that it increases browning, a reaction that works best in an alkaline environment. 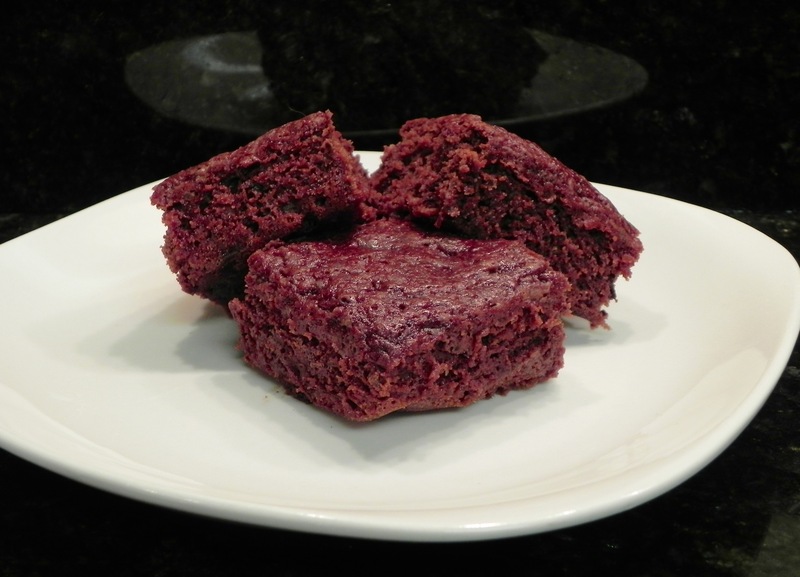 Browning not only adds an appealing color to baked goods, but it also enhances the flavor. This is why baking soda is added to some cookie recipes that don’t require the rising action of a leavener. Now that we have demystified baking leaveners, you can make substitutions with confidence. It can also help you troubleshoot a quick bread that wasn’t quite perfect. Or maybe that was my recipe that needs some tinkering. Why does high altitude affect baking? You have read in my past baking tips posts my hints for high altitude baking. I mention the lower air pressure and low humidity levels, but I don’t dig into the explanations. For science nerds, I will delve a little deeper. For non-scientists, my explanations are short enough – grab a cookie; it will be over soon. The lower atmospheric pressure makes a noticeable affect in baked goods. “Leavening agents such as yeast, baking powder or baking soda will have more rising power. That’s because the thinner air offers less resistance to the gases created by the leavening agent. Therefore, you should use less leavening (about 20 percent less at 5,000 feet) as your elevation increases.” If you use sea level amounts of leavening agents they will create more gasses, expanding and rising more quickly. It sounds good until you look in the oven and watch your gorgeous creation rise too fast and then fall, to ultimately suffer with the dreaded sinkhole. Another consideration for high altitude bakers is that “above 2,500 feet, the atmosphere becomes much drier. The air has less oxygen. … Moisture quickly evaporates from everything.” The problem arises when moisture loss is not accounted for when baking at altitude, so liquids are added to recipes to counter this. Another thing to keep in mind is that all high altitude areas are not created equal. I baked in New Mexico, an area with extremely low moisture in the air. Moving to Colorado, where the air has a slightly higher moisture content, improved not only the texture of my skin but that of my baked goods, too. 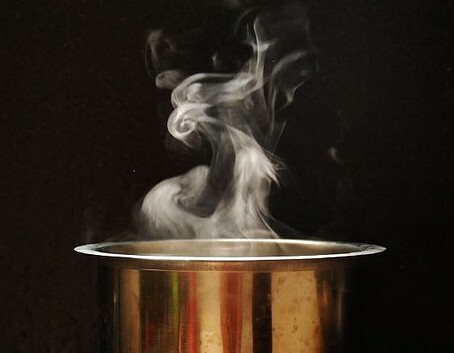 A high altitude change that affects cooking more than baking is that water boils at a lower temperature. “As the altitude increases, the atmospheric pressure pushing down on water decreases, which allows the water to boil at lower temperatures. A lower boiling point means that food cooks at a lower temperature, despite the fact that the water is boiling.” When food cooks at a lower temperature in water it takes longer thus requiring lots of patience to boil potatoes. Bakers will feel it most when they are cooking above water, such as when melting delicate ingredients like chocolate. Now that you have been armed with the scientific knowledge behind some high altitude baking alterations, you can see why changing recipes at altitude is so crucial. You can also gain insight as to why it can take six tries to perfect a high altitude recipe. At least you can enjoy eating the trial batches – we do!